It was not a very easy travel to LPU. I to some extent I love travel but too much of travel is very difficult. The schedule of travel was very difficult around 7:30 PM i started from office, my flight was around 10:30 reached Delhi around 2:00 and was there for more than 3 hours and then from 5:30 started from there and reached AMRITSAR around 6:45. From there Amritsar started in the bus and travelled to Punjab and reached around 10:00. It was very difficult travel which was first time inside India. I had the keynote session “Getting Started with Open source” where I was about to share my journey in Open source. Since I reached late the students were waiting that time was caught by Vishal, this is the really good attitude which I liked. I always say to my mentee we should always make sure no one waits for us. In India, still we are new to FOSS technologies, students / professionals still go behind Brand names even when they know / use the alternatives. So I got up freshen-up and reached the Workshop room around 10:40. There myself and Shivam started our session on WebExtension. This topic is always close to my heart. WebExtension is one the way we can interact with Browser Features and make them work for us. Browser is always meant for users to work, it will obey for us and this is the way its designed for. Browser are designed for people. Myself and Shivam divided the Session as below. Each and every session is unique, we get to meet large number of audience and learn something new from them. One of the feedback I got which was “They got to learn how the Keep by Google Add-on on Chrome sends selected data to keep.google.com” ( an example using Context menu) Around 2 PM we finished our session and started for lunch. In the afternoon session We had other session in the afternoon. At the end of the day we had some of the group pics and ice breaking sessions like Quiz. I was Unfortunate was not there for the second day, heard we had session on pontoon L10N tool, Aframe and many more. Please join us in congratulating Edoardo Viola, our Rep of the Month for February 2019! Edoardo is a long-time Mozillian from Italy and has been a Rep for almost two years. He’s a Resource Rep and has been on the Reps Council until January. When he’s not busy with Reps work, Edoardo is a Mentor in the Open Leadership Training Program. In the past he has contributed to Campus Clubs as well as MozFest, where he was a Space Wrangler for the Web Literacy Track. Each one of us have some goals to complete, things to learn, and places to visit. With the year getting ended, it is time to lock back and see what all did we do for the last 365 days. Well, 2018 have been a phenomenal year for me. Working with Addons aka AMO Team is where the major part of 2018 was spent. I have learned how to work remotely with a cross-cultural team. I have met some super awesome people like Caitlin , Rebecca and many more. I fixed ~50 Bugs in AMO. I got to meet a lot of great people, built connections and learned things. I am really happy to see few of my goals getting completed. I failed of the things miserably too. Got the idea for create-web-ext — a scaffolding tool for browser extensions. Talked to my mentor Trishul about it. Pitched the idea of create-web-ext to Mozilla Addons team and asked to submit it as GSoC Project. Declined as GSoC Project. Decided to go ahead to develop it. Made team with my Mentor Trishul and Tushar to start working on the project. First International Flight to Finland for Methane Hack. Won 1500 Euros. Spent many sleepless nights with Trishul, Tushar to work on create-web-ext. Made the prototype of create-web-ext. Trishul pitched it in Addons Show & Tell Meeting. Got good feedback about it . My first code contribution to AMO, a small patch for amo-frontend. Was working on another patch, sadly never completed it, huh. Was working on twitter card implementation for addons, sadly never completed it. Felt demotivated so many times due to this bug. Sent 3 patches in amo-frontend. Made the dropdown on AMO better. Learned about test assertions. Fixed 6 bugs in addons-server and amo-frontend. Deployed Static themes on production on AMO Frontend. Learned that RTL means Right to Left and LTR Left to Right. Wrote code in SQL for the first time ever for AMO Server. Met dgplug members Farhaan, Sayan and many others in DevConf’18. Fixed 10 bugs in addons-server and amo-frontend. First patch to Webextensions API. Went through many sleepless night to setup Gecko on my laptop for the patch. Took more than 15 days. Decided to dual boot with Fedora OS for Gecko. Sat next through to Wifi router for ~8 Hours to setup Gecko. Sent 5 patches to addons-server and amo-frontend. Added developer policies in footer of AMO. PyCon India, my 2nd time , which I attended as a volunteer. Met dgplug members again in PyCon. Applied for Mozilla Addons Reviewer. Rejected. Lesson learned — need to work on my JS Skills. College Exams, practical and lot of college useless stuff. Managed to solve 5 bugs in the mean time only. Joined Featured Addons Advisory Board for next 6 months. Helping beginners For 2019, I am looking to help few handful new code contributor to AMO Project because I feel while contributing in code you get to learn a lot of things like how to communicate, code is just one part of it . More patches. I am looking to submit patches to Addon Manager and Webextensions API in Firefox. Eat, sleep, code, gym, repeat. Being a software developer you are most likely to keep sitting on your chair for the major part of your day. This year I want to take out more time for physical activities. The post ASEAN Mozillian Localizers Meet at Hanoi, Vietnam appeared first on Bob Reyes Dot Com. On 26th morning I was very eager to meet all the virtual people in their physical forms. Had a few minutes of training session and met other facilitators who had come for the same purpose as me. I was thrilled to see people who were attending Mozfest for the 3rd or 4th time consecutively and learnt a lot from their experience as a veteran. Then we moved to our spaces and I introduced myself to the team. There I saw my family, yes they are none other than the wranglers of my space, and my face beamed with excitement when I met them in person. David Bild, Mariaon, Stephanie, Yo Yehudi and Marcos were all helpful to me throughout the days of the event, they guided and appreciated me for all the efforts I paid for. Then the big day came, it was 27th and I had to present my session on “Farmer’s Gear” under the Openness space and I was a bit tensed because my presentation was the first session of the day. Initially I did not see much participants but later I went around to call people for my session. Atlast some 7 interested folks joined me and a few left before the conclusion. Not sure if they had to rush for their own sessions or something more interesting than mine . But my purpose was solved, I wanted some inputs in a diverse context and I did manage to get it. Thanks to Dirk and Zannah for helping me to organise my session plan. Although my audience were 7 in number after my session I went all over the space to know what was happening. In this way, when I met people and they asked me what session I had been doing for the weekend I got to spread a word about my project to more 20 people and they also gave me valuable feedback, so my number of participants is actually 27 . But it is not just for the number I was happy to get some volunteers who were eager enough to contribute for my project. Moreover, there was another session which impressed me a lot. It was called “VR colored girls musuem” and my passion towards VR and AR drove my interest to know more about it. I attended the session and was also ready to contribute for the same. It was astonishing to know that LaBrina Loving, Community Manager from Microsoft was also part of the project. Mozfest is the right place to meet the people from Mozilla and Mozilla Reps program , which is my favorite part not just because I am a Rep but because of the sole responsibilities and other stuff I do as a part of the Mozilla Community of my region. Happy to meet Konstatina and Michael Kohler, I did clarify all my doubts and also shared my experience as a Rep with them. Also, it was great to meet Caitlin and discussed my ideas I had for Mozilla Addons and how eager I was to develop one. David Ross helped me to take a tour through the Science Fair and helped me to connect with more people. I was all about awaiting for the openings of Tech Speakers and got the right chance to meet Flaki and expressed him my crave to join the program. Please join us in congratulating Umesh Agarwal, our Rep of the Month for September 2018! He manages the Mozilla India Gear Store based in Pune, India. Umesh is a localization community manager for the Hindi language. He has recently successfully hosted ‘Mozilla L10n Hindi, Marathi, Gujrati Community Meetup 2018’ held in Pune on 1st – 2nd of September 2018. This event was part of the Mozilla L10n community events in 2018. The event was of very high standard, productive and ended up with great success metrics. Approximately twenty leaders of four regional languages traveled from various parts of the country to participate in the event. Thanks Umesh, keep rocking the Open Web! As usual this time also, at end moment I’ve decided to attend this conference and since this conference is organized by Red Hat so I was quite excited to speak here. DevConf first time happening in India. This conference originally started on 10 September 2009, this was the first ever conference organized by Red Hat Czech Republic in the Czech Republic and the rest is history. Due to flight delayed I reached the hotel late at night and was too tired but there some points left to add in the presentation. I was actually preparing some demos which I wanted to demonstrate to participants. Even after so much tired the energy level was same, thanks to Red Bull as well to keep me awake. I have talked on “JS Authentication with Auth0“. This was introductory talk about the JS Authentication, where we have discussed the role that Auth0 authentication plays in modern software development where it is a lot more than just the login screen. Speaking today at @devconf_in on JS authentication with @auth0 . Seesion will be held in Room No 5, Christ University. First, we gave a bit of background that Authentication and Authorization are two different processes. This time Viral Parmar who is a cybersecurity expert in his region join me for this session and shared some great trips to about online security. At the end of the talk, we have received so many questions but mostly on SSO as participants are quite curious to know more about. Some were working professionals and there were asking about how they implement SSO on their business set up so all an all it was quite a healthy discussion. Some questions we have answered them after wrap up and over a cup of coffee in break session. Also, while walking to booth sections got a chance to interact with many participants from the conference, some were known faces who attended our talk and some came up with new questions. This is the best part of being in the community where you will get a chance to exchange your knowledge and you always go back home with some new learning or experience. In my every event I am always seeking for feedback’s from participants/attendees/visitors, doesn’t matter its positive or negative because if you know the feedback you can definitely work on it to improve for next time to make it better. These two days I enjoyed as it was like more of a carnival and this was a great opportunity to meet a lot of my fellow Mozillians. A lot of whom I was contacting virtually so I little struggled to recognise them However, the multifacet community I had ever seen and always vibrant , so very proud a Mozillian. He is also a Rust contributor helping the Rust team evangelize the programming language by speaking at events and organizing them. As a Tech Speaker, he speaks about Rust, Blockchain, Machine Learning, Git and Open Source at events and conferences. Thanks Abhiram, keep rocking the Open Web! To congratulate him, head over to the Discourse post! DevConf Contributor Conferences are technology conference events for Linux and JBoss Developers, Admins, Linux and other open source project contributors, organized by Red Hat. This is the 2nd time happening at India, it was one of the amazing open source event I attended recently. Two months back CFP was released, as soon as I came to know about it applied for Mozilla Community booth, personally there was call from inside to apply for this meetup. We were very lucky our Mozilla community got opportunity to present various contribution areas at devconf, which is mostly dedicated to developers. And Priyanka shared about this in Mozilla India community mailing list. Before Meetup, one of the first task is to bring design for Booth, our theme was based on Rust, Firefox Family (& Webextesion), Aframe, we gave this requirements to Mozilla Open Design team, and one of contributor from India Tanzeel Khan brought the beautiful design (above one). But due to some issues were not able to print this, but in the large LCD TV we showed this majestic poster during break (when we are not showing demo). Second major task was to bring pull contributors who are going to speak at various sessions and also volunteers who can be at booth. Our plan is to make sure minimum 3 are present at any moment at booth. At first invited Ramdayal, Abhiram and other speakers, they brought in huge number of other Mozillians who will participate. The Day 1 started with amazing show by Christ University students. Then Ric Wheeler started Keynote “Open source is better for companies/businesses, communities and developers” of Devconf. Once Keynote is done, we (Ram dayal, Bhuvana and myself) started towards Exhibition area to setup up Mozilla booth. It was start of the day, there were already many open source booth setup by other communities ( Elastic, FSMK, devopedia , Openshift and so on..). Soon we setup the Mozilla Booth, large number of attendees started joining us. Soon Abhiram joined us to help and share about Rust Language. He started to share about Rust and also about his Amazing rust series which is available in lynda.com for 1 month trial. He brought the QR code ready so whoever wants to learn can scan and visit website directly. Sharing his Tweet which he made after event. At the mean time, on another side Ramdayal was sharing his experience about WebVR. Rakhi was sharing about Mozilla Contribution in general, I was setting up with the Code demo for WebExtension. Bhuvana was helping me to setup her WebVR demo , old but we can use this to explain about Aframe simply. After their session Mehul Patel and Viral Parmar came to Mozilla booth and sharing their knowledge about Rust and Privacy. Our Swag superstar Prathamesh Chavan traveled from Pune to Bangalore, and without taking any break he reached venue ( remember Bangalore airport to Venue will take around an hour). Around afternoon, Shivam Singhal gave his Session on WebExtension and Bhuvana gave her session on WebXR. And also Lavish Aggarwal joined us and started sharing about WebExtension. Around 5:30 PM we all Mozillians left after having some casual talks like what we are going to focus on future, and exchanged lot of interesting ideas. Around 750+ members might have joined us at booth. Second day started at 9:00 AM as usual. We made sure no one is waiting for us. The crowd was comparatively less at the morning as we had Keynote starting. We are joined by Jyotsna Gupta , Lavish , Tushar Arora , Abraar Syed , pooja and many others (sorry forgetting the names). At times went to other booths and goto learn interesting projects like Foreman, Elastic. Dipesh monga was giving his talk on second day about Dark side of Internet of things. At the second afternoon, I requested a click with Sayak, its not easy to catch him, I have been to pune twice for COEP FOSS Meetup and GNUinfy 2018 but was not able to meet him. He is one of the very good friend and we used to talk randomly for very long time. Along with us we have Swarnava Sengupta a very calm person who is amazing contributor to AMO advisory board and Mehul who is actively bring more rust contributors. On Second Day evening I was fortune to meet Deb, one of the long time Mozillian who was looked like Coding God for community members from Mozilla India, he is one of the greatest Mozillian I have met. We tried to capture some of group pictures, for sure some contributors who actively were in booth or giving talks are missing in pictures. Thanks to each and everyone who made this Devconf a amazing experience. It is one of the most recommended event and each developer should try to attend. We can get opportunity to meet many amazing people here. It brings us great sadness to share with you the recent news about one of our dear Rep we will so fondly remember. Abbackar DIOMANDE from Ivory Coast is unfortunately no longer with us. Diomande, was a Mozillian from Bouake, Ivory Coast and was contributing in various Mozilla projects including SUMO and L10n. He was a local community builder, that helped to build a healthy local community in his country while lately he had also taken the role of a Resources Rep, helping his fellow Mozillians on organizing local initiatives. His passing is finding us sadden and shocked. His contributions helped our community intensively and while we have a heavy heart, we know that his passion and inspiration will sustain with us. Puisse Dieu t’accueillir dans son royaume Diomande. Mes Condoléances à toute la famille. Diomandé a été un de mes meilleurs mentorés, il a aimé et est toujours resté fan de Mozilla , avec le coeur il a su toujours selon sa façon conduire sa passion pour Mozilla. Tu n’a pas souffert, que la terre te soit légère et tu puisse trouver la paix. Repose en paix Diomandé. Mes condoléances à toute ta famille, tes amis qui t’aimaient et toute la famille Mozilla. Courage, oui grand courage à la famille, un genie ne meurt jamais. Abbackar n’est pas mort, il nous attend juste de l’autre côté de la rive. Abbackar n’est pas mort, Abbackar vivra toujours. Un MozBoy est pati. Un arbuste qui avait toutes les aptitudes pour devenir une grande arbre avec de grande branches et un gros spectre d’ombre. La communauté a perdu un véritable passionné. YAKO A TOUS !!! Cher ami, c’est avec les larmes aux yeux et une grande tristesse que je redige cette note. Tu vas nous manquer! In the first half of the year, our focus was to align the program with Mission Driven Mozillians and prepare the mandatory Reps onboarding course to ensure it aligns with the D&I work. We have also started improving the understanding of issues of different Reps roles like Mentors and Alumni. We also worked on administration issues like the transition of inactive Reps to Alumni, the cleanup of old Reps applications still open after years and wrong mentors assigned to profiles and the improvement of our reporting system. Last but not least, we moved to the creation of expertise teams that took over everyday work day tasks from the Council (newsletter and onboarding). 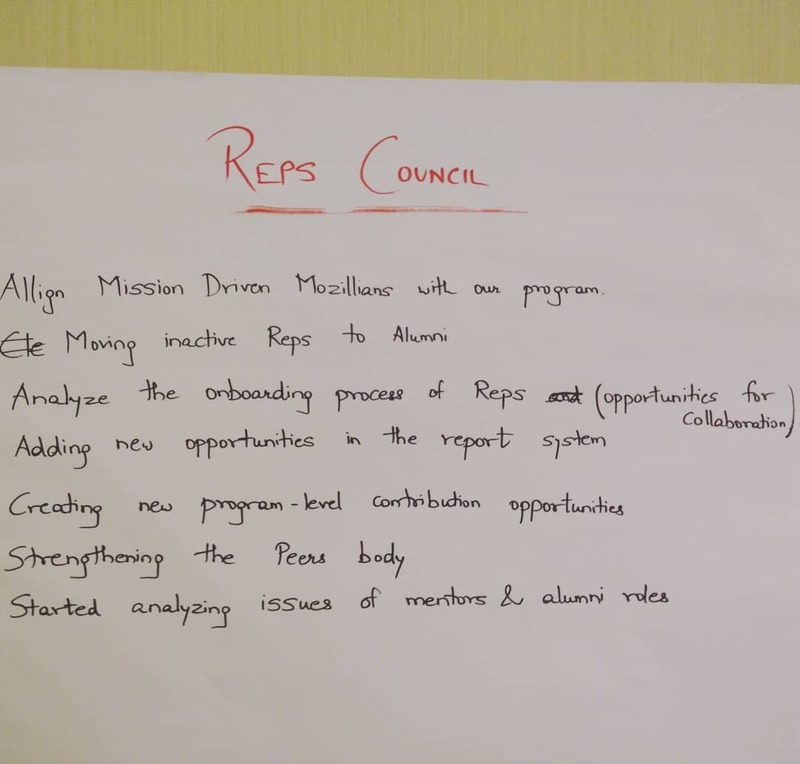 The Reps program is working to prepare the ground for Mission Driven Mozillians and there are different tasks and issues to face for that. The most important point for the Reps Council is the Roles of Reps inside the communities. We know that in Mozilla there are a lot of international communities, local community and project specific communities, and we need to understand and be ready to support all of them. This list of ideas will be evaluated in the next quarters by the Council and as usual we are open to feedback! Mozofest is an event organized by SRMKzilla club each and every year. This year they had big plans for this event. Usually they used limited number of events this year they had Speaker series, Hackathon and other events which educate about internet. Pic Credits: Mozofest Team from SRMKzilla. I was asked to filter the Call for proposals this year and also to judge the hackathon along with Karthick, Dinesh and Jayesh. It was 3 days events, and on first day small quiz competition , coding event and other happened. On 2nd day, Jayesh organized Hands-on session on Rust and on another side Bhuvana & Karan ganeshan was giving session on WebVR. At the end of 2nd day around 5.00 PM 24 hours hackathon was started. What is rust? Why rust? On 3rd day, we had our SRM FOSS Meetup, which was the most awaited moment. This FOSS meetup was inaugurated by long time Open source contributor from Chennai. Again on Day 3, we had a small introduction talk on Rust by Jayesh and WebVR by Bhuvana. We are amazing number of sessions by Mozillians. Getting Started to Open source by Balaji. Contributing to L10N by Dhinesh. Why WebCompact is important by Karthikeyan. Getting Started with Privacy by Sayaji. On the evening I gave a basic introduction Progressive Web Apps and Service workers by using a small demo (creating simple About us page). After all the session were over on that day, we were given opportunity to judge hackathon projects. It was very organized. Over 600 people from different parts of Tamilnadu came to booth, workshops , talks. The second day, I had an open session at the CNCC, where I was given a space where attendees came to interact and know about the project. The project I was having was of A-frame and WebVR. It was really fun to interact with the Chinese attendees as many were unable to understand or speak English, so I had to use VPN to use Google Translate( good translation ). Many were excited to know about A-frame since it requires a very little amount of background in computer science to get started. I have shared the links with them via email and wechat. It was a good day to conclude the conference and very happy to represent both Mozilla and Auth0. Thanks Prathamesh, keep rocking the Open Web! Please congratulate him by heading over to the Discourse topic. Please join us in congratulating David Ross, our Rep of the Month for April 2018! community he took on. David likes to plan ahead and he already has 7 upcoming activities he is going to participate at, including an event in summer of 2019 (that’s not a typo)! Last but not least he was a nominee for the recent Council election. Thanks David, keep rocking the Open Web! This is my second visit to Pune, after my recent GNUify event. GNUNify was mainly focused for Student developers, the target audience were getting started with Open source community. COeP Foss Meetup had well experienced developers and students who are contributing for FOSS community more than 1 year. Abhijit who is the professor at COEP and helping lot of students to get started with community. He is an amazing person I meet, who came forward to share his thoughts about my presentation and spends time with students and motivates them a lot. The hall was really big filled with 200 attendees. Energy was really good and I was really excited to give the presentation. For this presentation I have been showing the demo with Commands API and tabs.ExecuteScript API. The internet was really slow during my presentation, due to this therewas some breakage in the flow. Abhijit Sir, came forward to share his Mobile internet and I was able to show the demo of my Youtube Extension. Some of the questions came around the Chrome Compatibility, and one of the long time Mozillian Friend Ankit gave suggestions in improving the Extensions which is used for demo. After my session we had amazing session by Kushal Das on SecureDrop. Then we had a session by Rahulkrishnan on Docker. After the session we had a small Tea break session, where contributors from various projects came and had informal discussion. Some of the contributors who tried to become Mozilla Reps or tried to contribute to various projects shared the pros and cons in community. In the evening I went to Ankit home and meet his family, had a very good tea time with them. After that we went to the near by mall and tried some amazing local food. I personally felt this is amazing Meetup I have been. I really felt bad I didnt plan to attend the second day of the event. In upcoming years I will make sure to give talk on this Meetup. Personal thanks to Vikrant (student from coep), who was with me for the whole day. Three (03) Mozilla Talks in a Week! The post Three (03) Mozilla Talks in a Week! appeared first on Bob Reyes Dot Com. We’re so very happy to announce the new Review Team members who have just been officially on boarded. Welcome Michael, Pushpita, Jason, and Arturo to the team! The Review Team is a specialized group responsible in reviewing and approving or rejecting every budget requests made by Mozilla Reps. This team is working in close coordination and supervision of Reps Council. The new Review Team will replace the old members and team up with the 3 remaining members to continue the work for a year. You can check more information about The Review Team in this wiki page. Last but not least, I would also like to thank and appreciate the previous Review Team members Dian Ina, Priyanka, Faisal, and Flore for all their contribution for the past year in the Review Team. Your contribution & dedication has been a great help for the program so far. We can’t thank you enough for that. Please join me to congratulate all of them on the Discourse topic! Prayatna is one of the prime Technical fest organised by MIT, Anna University Chennai. It is an yearly where the number of students participating will be very high. This year our community organized One day workshop of WebExtension. This time Balaji who developed amazing Add-ons previously and student from SRM University came forward to give session about his Add-ons and the WebExtension API he has used. We started the session at 10:30 AM. First I gave talk on what are the different areas of Contribution where students can focus and which will be helpful to imrpove their professional skill set. Then I was giving the introduction of WebExtension. After that we went for small Hands-on Session. In this session we were using Commands API to build our own custom commands. Around 50+ students attended the session. Around 30+ received the follow up Email. It was one of the diverse group of students. Students across tamilnadu came. The reach about Mozilla community is good and many were interested to know about FSA program. KGiSL community space is very close to every Mozillian around Tamilnadu, we had our first meetup there. There are lot of events related to Mozilla and open source communities happen at this space. After so long time I got opportunity to come to this space and share my knowledge about the WebExtension. For this event, I personally started training 6 students before the event. My main goal is to make sure they are in good position to explore more about WebExtensions and answer the questions which are asked by their friends during session. It is like Train the trainers. We in Mozilla India community are doing great job by developing many WebExtensions but at the same time the number of trainers are less and it started increasing slowly in past few days. On the event day around 35 students appeared, the attendence was very less due to the Job Fair happening in the city all of the sudden. Till Friday evening there were good amount of registration but sudden announcement of Job fair made Final year and Third year students to go there. They are the main audience of the session. But some of them turned up. During this session I was discussing about ContextMenu, as the students will be more interested to hack them compared to any other API. The students present were able to grasp the knowledge very quickly. One of the interesting thing happned to me for the first time is, I have to work without computer; yes on that day I was using the Black board to teach students and this is the first time I am doing it. Explaining using Black board was very interesting and I was very happy to do it. I was excited to know two of the attendees developed their extension and pushed them to AMO. Most intersting and must needed part is, Sriram created Video about his extension, how he developed and explained his code, how to run it in browser. This is one of the great job done. I used to suggest many students about this, and Many techspeakers are now focusing on creating video tutorials, thanks to Sriram as he started at this early time. In future I will be collobrating with this students and planning to continue creating more vidoes about WebExtensions. This will be really helpful and we can bring more students as TechSpeakers in future. Later, these folks were excited and invited me as a speaker at their college. A lot of planning happened for the event and we were in touch almost daily for different things. We planned the event one and a half month in advance. Finally, on 24th Feb 2018, we decided to have a full-day event around FOSS at Aligarh Muslim University. We left from Delhi at around 6:30 AM in the morning. We then halted at a cafe known as Break Point around Aligarh to have breakfast. We reached the university at around 10:20 AM. We took some time to test the entire set-up and the event began at around 11:30 AM. I took the first session on Why you should contribute to Open Source. We discussed the question that somehow pops up sooner or later into everyone's mind while contributing to Open Source: What's in it for me?. We discussed various pathways one can begin contributing to Open Source Projects like coding, writing docs, managing team, advocacy, documentation, translation, bug triaging, reviews, organization skills, soft skills & tons of other things that come as a by-product. You can find the slides here: Why you should contribute to Open Source?. Then Shashank (@realslimshanky) took over and discussed manifest.json and it's importance. Later we developed a simple addon -- borderify, which displays a border on every site the user visits. Some students also modified their scripts to make their add-ons do different things and posted them on twitter. Shashank, me and Shivam Singhal (@championshuttler) helped everyone with their problems during the development phase. Since all of us are devs, we were able to quickly resolve queries of students. One of the most important things I noticed is that often people misspell either the name of their manifest file or some key in their manifest people resulting their add-on to not load during the debugging phase. A lot of them then created addons on their own and modified their previously created borderify addon to do more stuff. I've tried to collect some of them here. For a more verbose list you can visit Twitter and search tweets tagging me (@ErSanyamKhurana with #MozAMU. To make the session more interesting we gave add-ons stickers to anyone who answers the question about what we were just telling them. A lot of folks praised and tweeted about the addons they were generating. We were able to generate 10,000+ impressions with more than 4,000+ accounts reached on Twitter for #MozAMU. Till this time, I never introduced to anyone about who am I and most importantly not listed any of my contributions in any of the projects. I don't want them to feel overwhelmed and assume that we people have some sort of superpowers that we're able to patch bugs in any FOSS project. I always make it a point to encourage them and help them land their first patch. And my introduction summed that up in just one line I'm one of you -- a part of the community. We then hopped on to discuss How do I start contributing to Open Source? where we specifically discussed How to find bugs on different projects through Bugzilla & Bugsahoy. You can find the slides here. Then I discussed other Open Source projects I've contributed to like CPython, Django, Oppia, Mozilla's Devtools, Gecko-Engine & tried to find out similarities in various bug trackers. We then had a group photo with some of the attendees. So, we decided to hop-on to a restaurant nearby with the core-team of students that helped in organizing the event with so much enthusiasm. Then we clicked one last photo before leaving Aligarh at around 7:00 PM with the core-volunteers of the event who helped in all the preparations for the event. In the end, I would like to congratulate the students for making so wonderful arrangements and pushing up the FOSS community in their college. I hope they will now start landing patches in different FOSS projects & we'll all meet again soon. MakerFest has always been very closed to my heart because from here what my journey as a #Mozillian started and as result, this is my 2nd consecutive year as a Lead organizer and 3rd year as a volunteer from Mozilla India. Maker Fest is about developing a great maker community where people can learn and share about making. Creators, artists and hobbyist across the country are invited to present their contemporary applications of ideas using the vast ocean of art, science and technology. We are loaded with topics to interact with you on. Come soon if you haven’t, already and if you have, come again to interact anyway! First, Let me introduced to you with my super energetic squad of Maker Fest 2018. Pranshu, Rishita and Prathamesh led the charge for #WebVR at the #MakerFest2018. Equipped with VR Demos, they helped people recognize the power to do more with simpler tools through AFrame. HariOm, Kamlesh, Nilima, Drashti and Haard have been working on Pontoon by contributing in their languages to make their favourite browser accessible for people who would want to use their browser in their favourite language! During the fest, our volunteers met different age groups and found one thing common is that ‘Language matters on the internet‘ and that’s why Localization is the important part of the web where it will open doors for all age groups where language is no more barriers. Sameer, Viral and Pranjal helped people realize Why Privacy Matters, and how Privacy is a Priority in today’s age! We strongly believe that it is necessary for the people who use the web for various purpose to stay safe by understanding the impact of their digital footprint. I’m being the only Rust Contributor in the Squad for the MakerFest made people ponder about how this new-age language is secure, versatile, light and fast, All-in-One! Thanks, @mozillagram for featuring me & team. Rust is a systems programming language sponsored by Mozilla Research, which describes it as a “safe, concurrent, practical language”, supporting functional and imperative-procedural paradigms. Feel free to ping me anytime on telegram or twitter and I’m happy to share amazing things about Rust. On Day 2, we also had a workshop on VR & Aframe, You might be wondering what is Aframe? We had 3 amazing WoMoz in our squad this time and all 3 have done a splendid job. Kudos to you. Thanks Girls for making it more diverse. The best example is this question by Indian housewives. During this fest, Antonela who is Designer at Tor Project gave us a surprise visit at our stall and we had a great discussion about privacy over the web and how Tor & Firefox browser makes the web a better and secure place. One more thing, she has a super awesome smile. Really appreciate the work done by the all the volunteers. I believe, volunteers are doing good for others and the community, which provides a natural sense of accomplishment and being the team lead I have seen that in them. Hey Team, your role as a volunteer can also give me a sense of pride and identity. Thanks for your all hard work and I hope you enjoyed volunteering this fest. Why is Feedback important? so I believe Feedback allows us to build and maintain communication with others and the most important information collected from post-event surveys is whether attendees found value in the event, whether it was worth their investment of time and resources, and whether they would participate in the event again. 1. "Want more mail trackers in Firefox"
2. "Many addons not compatible with quantum"
The Squad for #MakerFest2018 made sure people knew about the Web they are in, and how fast and far they can go if they go together. Often questioned, why are we doing this? We let them know that we are mere volunteers who are working to make the huge Web we are a part of, a healthier and a better place to be in! Divided by Regions.United by one Open Web.We are #OneInAMozillian! Curious to know more? Follow the #MozillaAtMF18 hashtag on social media. Full Album – MakerFest 2018! GNUnify is one of the amazing event where each and every year Mozilla India community make sure to participate. GNUnify is an annual gathering consisting of Free and Open Source software workshops, talks, seminars and BOFs (Birds of a feather), hosted by the Pune Linux User Group(PLUG) and the Symbiosis Institute of Computer Studies and Research(SICSR) in Pune, India. It is an amazing opportunity for people from FOSS communities all over India to meet each other and a good chance for newbies to find out how to get involved in FOSS projects and learn more about the free and open source culture. Mozilla has been actively participating at GNUnify since 2008! This year along with the Mozilla contributors around pune I got opportunity to organise a workshop on WebExtension at GNUnify 2018. One of the main reason for my visit is to bring some more contributors to WebExtension community and bring more webdevelopers into WebExtension development. In one room we had talks and in another room I was organising workshop. It was jam packed and very tight schedule, we Mozillians were not able to talk till 3 PM. I was very excitied to talk on GNUnify, from 2015 (I wanted to talk about FirefoxOS previously) I wanted to give talk there as it was one of the big event we have related to open source technologies in India. As I got opportunity this year I was very happy to delivery it there. I reached the venue sharply at 9:50 and was having some discussion with volunteers about the event in past and how it grew, the story they had about this event was amazing and it gave some more energy to me. And we started my session at 10:15, I started why we need WebExtension and backgrounds of it. But 10:35 the whole lab was filled with Students and Professors (I remember talking to 3 professor at middle of session and around 50 were there). After some thoughts on WebExtension I showed them the demo of my favorite extension (Youtube controller), shared the story behind it. People got excited to know why I developed it, and the next one was to search a particular word in different search engine sites. Around 11:15 we started to have hands-on session. First I started explaning them explaning about manifest.json and what are all the mandatory keys and values that has to be present, once they get familiar with it I started explaning the background.js file which we coded for our “search add-on”, using contextmenu. I showed the code sample with duckduckgo, but some of them understood the logic and tried to bring their favorite search engines (like Google, youtube, bing, wikipedia). Then we had a small break. After this we developed another add-on where we will be having our own custom shortcut keys for close the tab. The attendees were interested to learn more on hacking WebExtension API. One of the amazing unique thing they felt is they are able to build similar to browser internal features. They wanted to dig more and bring some amazing Extensions in future. The response from faculty and students is amazing. I had personal talk with students for more than a hour and got chance to talk with Faculty who is handling Web Programming session. She shared it is interesting session and told she will ping back to discuss how WebExtensions can be made into their college syllabus. In future I am sure, lot of amazing contributors will be coming as a effect of this event. One note which I came to know at the end of event is most of Reps from India who are present today came from this event. I personally would like to thank all the Mozillians around Pune who made my day great and memorable one. Special thanks for the care shown by Prathamesh parenets, I didnt felt I am going for the first time to his home. The garden at their home is really good and well glued with nature. I am inspired a little bit by his father, may be in future will start gardening in my apartment. In frame with some enthusiast attendees. This was the best memento ever, Thank you GDG team. A Saturday well spent teaching students about Open Source, Add-ons and Privacy. We had an activity at Indira Gandhi Delhi Technical University for Women (IGDTUW) for Addons, WoMoz and Privacy. The session started with Trishul giving a talk on getting started with Add-ons. He explained about Web Extensions and how they are useful. He also depicted some of the extensions built by the community. He explained the use of manifest file and then students started making simple add-ons on their own. The borderify Web Extension was chosen to teach students. Me, Trishul and Shivam helped them whenever they were stuck. The next session was took by Faye on Women in Mozilla and how we can improve the no of women contributors in the community. The third session was took by me where I discussed about What is FOSS and why people should contribute to FOSS. We then discussed on various pathways one can start contributing. We also discussed on finding bugs through BugZilla and Bugsahoy for Mozilla. Then Shashikanth discussed about importance of Privacy issues. We recently organized Moz-Fedora Day, a one day event on promoting FOSS through Mozilla & Fedora at Investopad, Hauz Khas, Delhi on Jan 13, 2018. The aim was to depict the usage of packaging & building one of the Mozilla's project using Fedora. The core event focused on making the participants automate the build of any of the Mozilla's open source project of their choice. The aim is to influence people to switch to Linux as a build environment (We used Fedora for this) and introduce the basics of the version control system (Mercurial in case of Mozilla). The event will also introduce to Vagrant for running standardized virtual machines for build environments. The session began with Saurabh representing a bit about Fedora and other Linux Distributions. I discussed about Mozilla, it's mission and different projects. We then decided to package Servo in Fedora and guided folks through the steps to build the system. We used simple Vagrant setup to package Servo project with Fedora. We also distributed some swags to folks who were able to make builds successfully. Most of this was a hands-on session and I saw new faces who were truly excited to learn about these things. A Saturday well spent, spreading the love of Open Source. We had MozCoffee Delhi on last Saturday, Dec 23, 2017. We had a lot of Rep Attendees this time with other Mozillians. What would have been a better way to end an year than the MozCoffee. From past various months, the activities in Mozilla Delhi came to a stand still. But then we had MozCoffee planned in less than a week. Thanks to my new mentor Trishul for arranging MozCoffee at Chaayos, Connaught Place, New Delhi on 23rd December, 2017. We gathered up at the venue in the evening and met a lot of new and old people. We had Trishul, Faye, Sanyam, Tanzeel, Dvyik, Rajiv, Saurabh, Pushpita, Shivam, Tushar at the meetup. The discussion started with Trishul explaining about his experience in All Hands Austin. 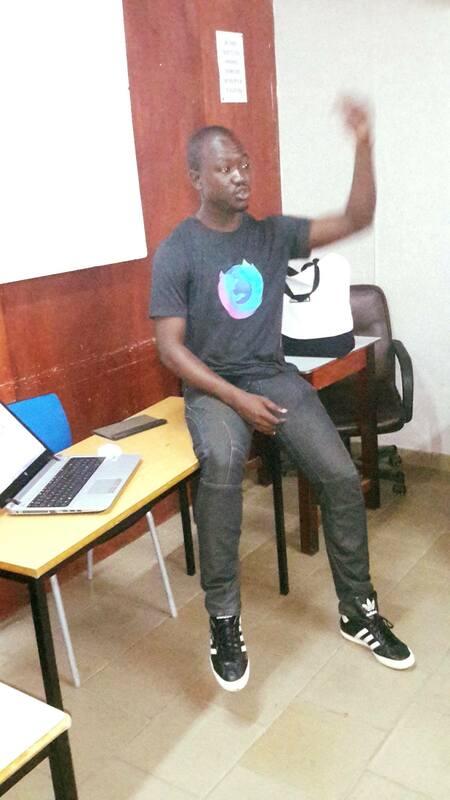 He told about various projects that have been identified by Mozilla as the major areas of contributions. We discussed about both tech & non-tech contributions in various areas. Near the end of the event, Trishul also helped me in explaining about addons. Since I've previous experience with JS, it was pretty easy to pick that stuff up. Finally, we had some amazing photographs which would now become a memory for all of us. 2017 is one of the amazing year I had. I have dedicated it fully to learn and share my knowledge about WebExtension and develop some WebExtension during my free time. This is one of the milestone month for me, I got an opportunity to share about WebExtension in our local ILUGC meetup. ILUGC is one of the amazing community which is having the regular meetups for past 10+ years. Giving session there was really amazing and was an exciting one for me. Then at the last week I was able to visit SRM Univ after a long time and gave some basic introduction talk on WebExtension and Mozilla Community. In march our MozillaTN community organised our first ever over night hackathon at KCG college of Technology chennai. We had 2 tracks WebVR and WebExtension. I was handling the WebExtension session and was mentoring the students on how to build it, and it is also my first hackathon with WebExtension development. Then on the last week went to VIT chennai to share about WebExtension, It was one day session where introduced students with WebExtension and also had some coding session to develop a small addon to close the tab on click of browserAction button. Between April and June sometime I was involved in developing some add-ons and wrote blog posts about them. Went to KCG Community space and shared about WebExtension development. We had the half a session to understand about Tabs API. And early July I started planning about WebExtension on-line series where planned to create vidoes and train attendes one API per day and discuss about them on how to use it for developing WebExtension. Went Dhirajzilla engineering college at Salem and gave an introduction talk about WebExtension. The biggest gift and surprise I got from the students I was able to meet my under graduate professor there. That was the happiest moment and I was giving talk in front of my professor about WebExtension. She was amazing person and inspired us a lot, she played a major role in shaping me and my friends during our college days. And went to Sairam college to have a booth and tell students about Mozilla communities in booth and gave a short quick talk Why WebExtension are amazing. This is one of the good month. We planned a good open hackaton (any students, employees can join) at out KCG community space. This is the first open hackathon in that community space and around 20+ attendees attended and demoed 6+ addons. Went to another hackathon at SNS College of Tech Coimbatore, where had amazing set of students with good knowledge of what they are going to develop. SRM university approached us and wanted to have a good purely technical hands-on session. This time we had 2 days session again (my 3rd one in a row). I was showing different demo and people loved contextMenu and omnibar search and most of them showed demo on it. And they were interested in learning it continously and the guy who hosted us was amazing, thanks to Anirudh for this opportunity. In November after a long time had opportunity to talk at over night hackathon along with Santhosh, Karthick, Trishul. It was amazing to see kids right from 13 years. Some of them showed amazing demo like text-to-speech using Web APIs. It was cool at the same time was so tired. It was great to plan for 2018 related to WebExtension. I am very exciting for upcoming days. Weeks of Contribution Series of talk about WebExtension. MozillaTN SFD Extension Hackathon at KCG community space. Having started writing a book on WebExtension along with Karthick, hopefully will be finishing by March 2018 and publish the first version for all the contributors. 2017 is ending with great moments, expecting 2018 will be much more awesome and helpful to learn more. Happy new year. Right now, I’m on my flight back from London where I had the pleasure to assist to the Mozilla Festival 2017. I’ll try to use this 2 hours of my flight time to relate to you how my experience was before and during it as well as the things that really impressed me of it. Let’s rewind to the first beginning of the Festival, Friday 27 at 5:00 a.m. On that time, I was just waking up after getting only a few hours of sleep because of all the excitement I was having for the festival, so I got dressed up as a zombie and after a really fast breakfast that consisted on the remaining cookies of the pantry and a really hot coffee that seemed like magma, I headed towards the airport. There, some boring and long queues where waiting for me, as well as, the not well-received security checkpoint where I had to take from my bag all the electronic things I had on it (More than half of a dozen, I think the security guy got crazy when he saw it). Finally, I made it into the plane and I headed towards London. Once there, I used all the time I had until the festival to do some sightseeing in London and visit the typical places you usually go as a Tourist like the Big Ben, the London Eye or the Queen’s Castle (With the famous queen’s guards on it). Also, I tried the so famous “Fish and Chips”. After all of this, it arrived the time, the time to go the Mozilla Festival in Ravensbourne. The next morning, I woke up, 7 a.m. After some improvised breakfast in the hostel, I went to Ravensbourne, today it was the day to start with the sessions. I went to sessions about confidence, others about Privacy and also, I attended a really interesting talk about Matrix.org. The lunch time was also kind of Networking so I tried to engage in different conversations with people around me, amazing time. At night, Mozilla organized a party on the Royal Society of Arts (RSA) where there was some electronic music by a guy dressed like Tron, with really futuristic design and music. There was also some comedy on the Auditory, it was a great night but I headed back sooner than I expected because I felt really tired of all day sessions. Third and Last day… We started the day with a Networking Breakfast in Ravensbourne sponsored by Flattr (You should check them out, they have great ideas). After it, I decided to go around and try the different stuff available on it instead of going to more sessions. There, I had the pleasure to try a great VR game about some experiments that took place in the military, also, I got to know about The Data Detox Bar and a bunch of other great stuff there to. Finally, it was time to go, so I had to say bye to all the people I met during the festival day and I headed to the train (Funny story here, due to the time change, the app became crazy and it changed my whole schedule. I decided to trust my gut and I followed my prescheduled journey hoping to don’t lose the flight. It worked and after some crazy runs up and down the London Bridge station, I made it into the train and I headed towards the Airport. It was time to go back home. I was in high school, sitting in the Computers room, taking part of a boring and monotonous class about Office IT. Because of that, I decided to open Firefox and start surfing the web for some entertainment to make the time passed faster. So, I clicked in the Firefox logo, Firefox popped-up and as soon as it opened, I realized about of a yellow square at the bottom of Firefox asking me to took part of Mozilla and become a volunteer. In that moment, I was dubitative because I didn’t really know what to do or if it was worth it but I recalled a conversation I had with my best friend at that time about Mozilla and its principles and decided to give it a try… I pressed the yellow squared button and it redirected me into a webpage that showed me all the activities I could join (Labs, Localization, Coding, Marketing, QA…). After a few minutes, I decided that I wanted to help with QA, testing some products as Firefox Beta, Firefox Nightly or the now ceased Firefox Aurora because I wanted to make Firefox a better browser with less bugs and more stability. Once I clicked it, it opened my email prompting me to write an E-Mail to the responsible of QA Area in Mozilla Hispano (who I would know later as Gabriela) stating that I wanted to contribute in that area and the reasons for it. I wrote the email and she quickly answered it giving me some tasks to do in Teambox (A site we used in order to organize tasks and activities) as well as giving me some mentorship so I could start helping as fast as possible. Time passed really quick and I went from being a newcomer to be part as a member of Mozilla without with no more mentorship. Anyway, I kept in touch with Gabriela because she was my friend and still the responsible of the area. As time passed by, I saw a drop in the participation of the QA area so I proposed Gabriela a new scheme for it. She really liked the idea and she decided to offer me the possibility of being co-responsible of the area so I could help her with all the task involved which I clearly accepted. A year passed without a lot of changes, I routinely participated in the friday testdays about Firefox Beta, we also organized an amazing Spanish testday which was well-received and well-appreciated for the Hispanic contributors of Mozilla and I tried to help in other areas like Marketing or Localization. One day, I saw a notification about a QA/Localization hackathon that would take part in Paris somewhere near November 2015. The idea of going to Paris to the Mozilla Office really fascinated me and I applied as fast as I could, wishing to be selected for it so I could have the opportunity to meet other people as passionate as I for Mozilla. Somehow, my wishes became true and I got the chance to travel to Paris and meet some contributors there like Facyber (My great friend Marko) or Marcia, a nice woman from Mozilla which I only had the pleasure to talk by iRC and the one who taught us all she could about FirefoxOS in the short time of two days. It was a really great experience. Sadly, one day, Mozilla decided to cut off Firefox OS, and that decision took with it some ups and downs which made some contributors leave the community because they didn’t see a clear orientation or a clear focus and all the communities of Mozilla around the world saw a big break on its activities. In that moment, I was really busy studying for the exams of the university and other stuff so I became really inactive for a few months and I did not really see what was coming. Once I returned, I realized how everything was stopped and I felt really guilty for it. For that reason, some contributors and I decided that it was time to relaunch the community and we got down to work for it. At first, we took some surveys and we decided some goals for the community but this approach didn’t clearly work out, so some months later, we decided to take it back and we proposed some interesting new projects to work on and as of today, it seems it has worked because we got new projects and new contributors working on them. To conclude, I have to add that after relaunching the community, I got really motivated so I decided that it was time to step up and apply to become a Mozilla Rep as other people recommended me. So, you wanna join us? The Mozilla Reps program is open to all Mozillians who are 18 years of age and above. Before you become a Mozilla Rep, you must complete a short but rigorous application process in order to demonstrate your interest in and motivation for joining the program. Are you ready to take on the challenges and rewards of advancing your leadership to the next level in Mozilla? If your answer is YES, apply to become a Mozilla Rep today! Not sure if you're ready for Mozilla Reps? There are many other ways to take the lead in the Mozilla Community. If you're a student, register for the Firefox Student Ambassadors program to gain experience leading projects at your school. And all of our contributor opportunities are available to you on the Get Involved homepage. Fill out and submit the Mozilla Reps application form. A Mozilla Rep mentor will be in touch within 24 hours. If your application is approved, you'll be invited to be interviewed by a member of the advisory council over IRC or IM that same week. The interview lasts about 15 minutes and you will be asked some simple questions about yourself, your experience contributing to the Mozilla project and, of course, your motivation for becoming a MozRep. 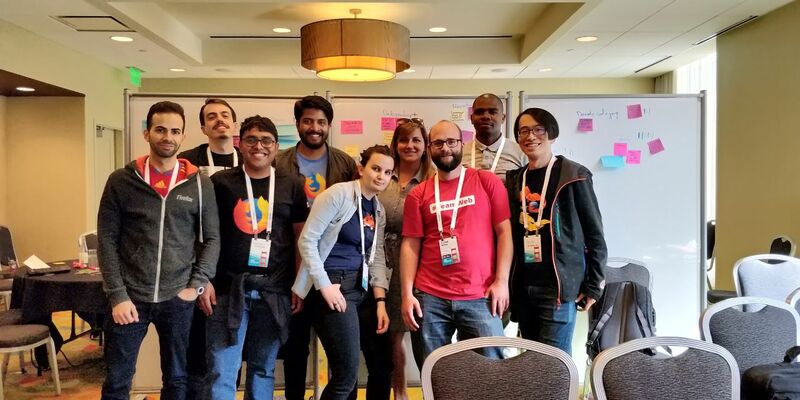 If you're accepted into the Mozilla Reps program, your mentor will get you started and familiar with the tools at your disposal to start organizing events, requesting budgets, swag, etc. And just like that, you could become a Mozilla Rep!